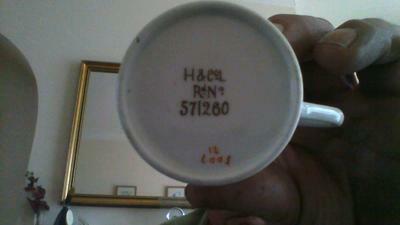 H&Co L - a mark of Haviland & CIE or not? Hi Peter, I've worked in the construction industry for many years,and always been interested in antiques, so as a hobby for the last 18 months I carry myself off to the the local car boot sales or trawl the local charity shops and purchase various china pieces,as a way of enlightening my knowledge. After my purchase I research my finds via the internet or reference books,thus giving myself a rough minds guide to pottery, as I'm only learning and probably never break the ranks of a novice I haven't wanted to to specialize in one manufacturer. So I tend to go for pieces that have a bit of age and quality or in some way varies from the norm. 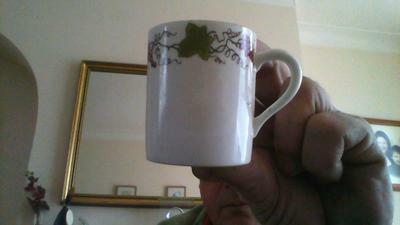 A few weeks ago i bought a miniature cup and saucer from my local charity shop. On researching it i assumed it to be Haviland & Co circa 1890. Transfer print, hand painted but am not quite sure, as i am unable to exactly match the logo. formatted in the classic diamond shape or are there variations, if so where would I research these in the future. I can't see a match. I don't know who http://ancientpoint.com are - they call themselves "World's largest web museum" so you you would think a legit site. But for me (a non-expert in these matters) this set looks as if it was painted by an amateur - perhaps when china painting was all the rage in the 19th century. Looks to me like they've done their own version of the mark and made up a registration number. The kite registration mark was British, not American as far as I know. Most Haviland is French/American, not British. Sadly, I don't know if the US had their own version of the registration system. So this set is a bit of a weird hotchpotch, so I find it confusing. We await a Haviland expert! 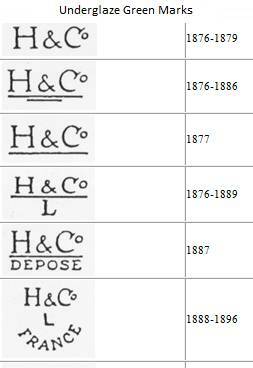 Comments for H&Co L - a mark of Haviland & CIE or not? 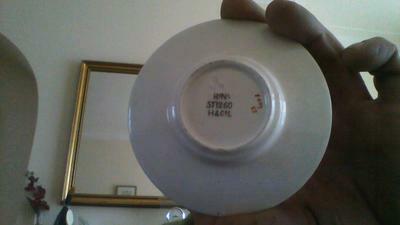 I have a veg dish, with the lid. It’s the blue flower design. 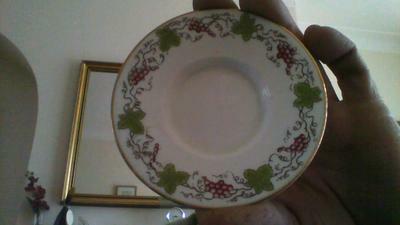 How do I find more information about this bowl, it’s value, and anything else my granddaughter will want to know someday. Return to 3. China Chat - French Marks.